As I told you earlier in the week, one of our Thanksgiving desserts was this cheesecake recipe I’ve been waiting rather impatiently to make. It takes two of my very favorite things – pecan pie and cheesecake – and makes one fantastic dessert. First, a bit about the preparation. This is one of the simplest cheesecakes I’ve ever made. The crust was a breeze – only three ingredients. I decided to sacrifice full crust coverage for a bit thicker crust. So, it didn’t go all the way up the sides, but each bite provided more crust. The cheesecake filling did cause me a few fretting moments, as I worried that it was too thin. It was indeed much thinner than any other cheesecake I’d made previously. My worries were for nothing, though, as it baked up perfectly. And without a crack in site, I might add. We had several desserts to choose from, but I don’t hesitate to say that this one was by far the most popular. Some of the comments heard around the table: “That’s the best cheesecake I’ve ever had.” “Don’t ever make any other cheesecake.” “Can we have this again for Christmas?” “That’s the best thing I’ve ever eaten.” A couple of folks even secretly wrapped up and hid pieces to ensure that seconds would be enjoyed later. I don’t say these things to imply praise of my own baking. I say them to encourage you to make this cheesecake! So, it seems this one may make another appearance for Christmas. As for me and Quinn, well, we happened to be lucky enough to make it home with a couple of pieces ourselves. 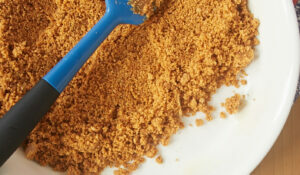 Combine wafer crumbs and brown sugar. Stir in melted butter. Press into bottom and up sides of a 9″ springform pan. Bake for 6 minutes. Set aside to cool. Bring to a boil over medium-high heat. Reduce heat and simmer until thickened, about 8-10 minutes, stirring constantly. Pour into crust and set aside. With a hand mixer or stand mixer, beat cream cheese at medium speed until creamy. Add brown sugar and flour and beat until fluffy. Add eggs one at a time, beating well after each one. Stir in cream and vanilla. Pour over pecan filling. Bake for 1 hour. Turn off oven and leave cheesecake in oven with the door closed for 1 hour. Remove from oven and run a knife along the outside edges to loosen cheesecake from sides of pan. Let cool. Chill for at least 4 hours before serving. 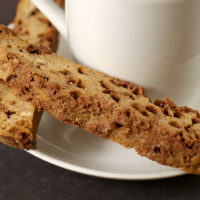 Absolutely mouth watering, and it combines 2 of my favorites dessert also! I bet that was popular at the dinner table! I’m sure this disappeared in no time! Gorgeous! One of those piecesthat was secretly wrapped up made it to my house but did I get any of it? NO !! I think it was secretly eaten by someone hiding in the pantry. It really was delicious and at Christmas I’ll get own piece to bring home!! My mother makes a chocolate version, too. Great! This is the BEST cheesecake ever. It tastes like pecan pie filling, which we all know is the best part of a pecan pie. I think I’ll be sneaking home a piece at Christmas. In fact, I think I’ll get my dessert before the main course…that way I’ll ensure that I get a piece of this cheesecake at all! Great job on the cheesecake and all the other things you did to make Thanksgiving so special! And, I’ll be making this cheesecake! Thanks, everyone, for the lovely compliments! Picsel, thanks for the info on the similar Romanian dessert. I’m not a big fan of raisins, but most any kind of nuts are fine by me! 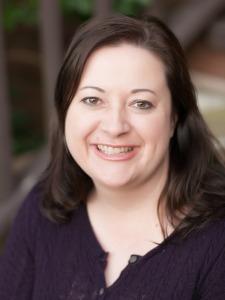 Jane, welcome! I hope you enjoy the cheesecake. Be sure to let me know what you think! Wow, does that look wonderful! I don’t like pecan pie — I like the crust and the pecans, but I don’t like the texture of that corn syrupy layer. This looks much better to me. I made this cheesecake to take to a Christmas party last night. Everyone enjoyed it very much. Fortunately there was enough left over for my family to have small pieces tonight. My husband’s favorite desserts are pecan pie and cheesecake. He is nuts for this dessert! Tracy, this still has the flavor of pecan pie but without as much of the filling you don’t like. It might be just the thing for you. Anne, I’m so glad the cheesecake was a hit! It sounds like your husband has great taste in desserts – those are two of my favorites, too. I made this for Christmas Eve. It was my first cheesecake ever! Unfortunately, it was a little underdone in the middle. But live and learn! Congratulations, Lauren, on your first cheesecake! I’m sorry it was underdone. Maybe it just needed a little more baking time. This cheesecake was amazing Jennifer!!! Thank you so much for posting it! I made it for Christmas Dinner and it was a hit. I did find the pecan pie part got super hard, so I think I must have overcooked it on the stove. Still incredible, though! Amy, I’m so glad you liked it! I made it again for Christmas. My cousin Jenna met me at the door asking, “Where is it?” It really is extremely good. Well, I did claim TWO pieces at Christmas even after our cousin, Jenna, stalked the kitchen to claim her share when the desserts were served. I can’t say enough about how good this cheesecake really is. This may be my all-time favorite pecan pie/ cheesecake ever! I had my own oven issues getting this thing baked, but it was YUMMY!!! I can’t stay away from this website!! Cindy, I’m actually shocked to hear that Jenna gave up any of “her” cheesecake, but I’m glad you got to sample it. Thanks for stopping by! I made this one last week, and it was a HUGE hit! I didn’t realize how many people like pecan pie. And combining pecan pie AND cheesecake just put everyone over the edge in a good, good way (myself included)! Anyway, I’m wondering if you’ve tried baking this one using the Crownover method you talk about in the PB cup cheesecake recipe, as my lone complaint about this cheesecake is that it looked like it was going to refrain from cracking … until sometime during the last 30 minutes in the turned-off oven, when it developed a Grand Canyon-sized crack in the center. I’m wondering if the Crownover method might help keep this cheesecake from cracking (and if you’ve tried it or have any thoughts/speculations). I made this pie shortly before I graduated from high school back in May and it was amazing! The only thing that was odd was when I stored it in the fridge over night, it tasted different the next day…but then the day after that it tasted awesome again haha. So I wonder, when you all make this, is it eaten immediately afterward? I plan on making 2 more of these for a friend and one for family this Thanksgiving. Devin, I usually try to make my cheesecakes a day ahead. I keep it in an airtight container, which usually keeps other smells and flavors from attaching to it. Glad you liked it! Jennifer, I don’t use a water bath for this cheesecake. I’ve made it several times, and it only cracked once. Enjoy! Have you ever tried to make this cheesecake ahead and then freeze it? Thanks! Pam, I did freeze it once and then shipped it to someone. It worked very well. 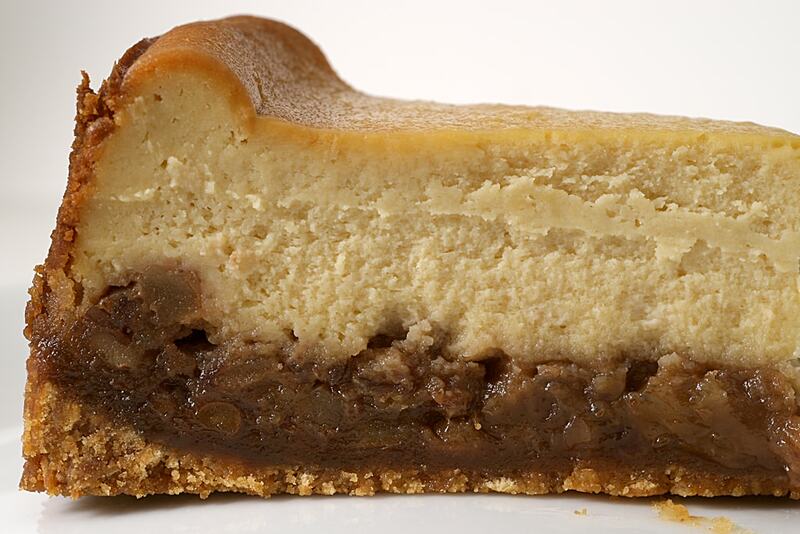 I just happened to stumble upon your website when I googled pecan pie cheesecake. Your recipe looks amazing! I can’t wait to attempt it for Thanksgiving…I’m just hoping I don’t screw it up! And then I stumbled upon all of your fabulous photos of your incredible recipes. There’s about 100 I can’t wait to make! Thanks so much for a great recipe!! I made this for Thanksgiving and it was amazing. So simple to make and everyone loved it. Thanks for an incredible recipe! I’d like to thank you for this amezing recipe. Two of my favorite foods, pecan pie and cheesecake, in the same pan, this is definitely a dream! The all preparation turned out perfect! But I was afraid when I put the cheesecake filling over de pecan filling, ’cause they both a bit mixed together. However, once the cheesecake was in the oven, I guess the pecan filling went back in the bottom, ’cause the final product was like your pictures: wonderful! Here’s a fifth way to satisfy my cheesecake and pecan pie addiction (I’m already fan of Maple Pecan Pie, Chocolate Chunk Pecan Pie, Pecan Cheesecake Pie, Date & Pecan Pie – that I make usually in tartelets, this is even more beautiful and tasty). Also, your website is really good, I’ll try some of your other recipes soon. I’ve been tinkering with the idea of a cheesecake like this for some time. I was glad to see that someone had already made it. 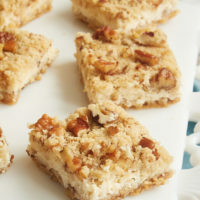 I was curious, would it be possible to use a standard pecan pie filling recipe as well as any ol’ cheesecake recipe for this? 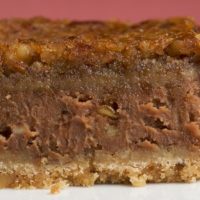 I have an old family standby pecan pie recipe that is delicious and would love to incorporate it with my own cheesecake recipe. Has anyone tried using a “standard” pecan pie recipe with this? If so, how did it work? Thanks in advance, I really do appreciate it! 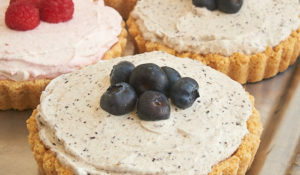 I just posted a blog about your delicious cheesecake! I had trouble with the filling, but it was great nonetheless! I meant to say that I just made a blog post about the cheesecake!! Oops! What a waste! I made a pecan pie cheesecake years ago that was delicious and was looking for it again. Unfortunately this recipe doesn’t compare. This pie turned out horrible! The whole thing is going in the trash. What a waste of expensive ingredients. The crust came out very dark from baking so long, the pecan layer was very dense – not at all like pecan pie, and the cheesecake layer was very eggy! I consider myself an experienced baker and I’ll keep searching for that pie I made years ago! I followed this recipe for Thanksgiving this year and my family went bananas over it. My father-in-law, who rarely complements anything, said that this was the best cheesecake he’s had in his entire life! I will certainly make another one when we visit my side of the family this Christmas. This was the first of your recipes that I’ve tried and I’m hooked! I was inspired to buy a new stand mixer so that I can crank out more desserts. 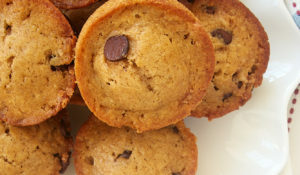 Thanks for being so awesome by sharing your wonderful recipes! I plan on making this awesome pecan pie cheesecake for Christmas!! It looks wonderful. My Manager made this cheesecake, oh boy this is the best cheesecake I ever taste. It tasted just like I want a cheesecake to taste. This cheesecake is off the chain!!!!!!!!!!!!!!!!!! AMAZING! I made this for my grandma’s birthday which was Thanksgiving Day. We had it Wednesday and she said it was her favorite thing I have made, and she has had tons of my baked goods! I used pecan sandies instead of nilla wafers in the crust, reduced the sugar in the cheesecake mixture to 1 cup and after the hour cooking it was clearly done, so I left it in the oven but kept the door open so it cooled slowly. Thank you thank you thank you for this, it will be made again for sure! Made this yesterday and it was ridiculously awesome. When I took it out of my spring form pan, it was so ugly. So, I whipped up a batch of whipped cream, frosted it like a cake and added crushed pecans to the sides. Gorgeous and delicious. Every single person loved it and my hubby refused to let anyone take any home. Lol. I’ve been looking for this recipe for years (ever since Edwards stopped selling them). Can’t thank you enough for making it available. It’s my favorite cheesecake! I made this for Thanksgiving and it was awesome! We forgot to get dark corn syrup at the grocery and had to run to the convenience store, where they only had light corn syrup. 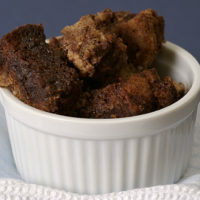 We ended up substituting dark brown sugar for all the sugar (even in the cheesecake layer) to give it an added richness. It was fabulous! The more delicate cheesecake (which was the perfect thickness) was an excellent complement to the super decadent pecan layer, and the crust was a great alternative to graham cracker (buttery and a tad crumbly/crunchy). The only issue we had was the crust became difficult to cut after chilling. Fantastic fall recipe! This may be a stupid question but do you bake for an hour AND leave it in the oven with the doors closed for a second hour? Ok just clarifying. Thanks Jennifer. I am so excited to make this for our family New Year’s Day dinner and I didn’t want to mess it up. So looking forward to hearing the ” Mmmmmms” from around the table! I want to make this for thanksgiving, but my questions is about the filling. How can you combine all the ingredients and boil them when you can’t boil the eggs? Do I add the eggs after the filling has cooled? Thanks in advance. Hi, Asya. I’m not sure I understand your question. There’s no boiling at all. When you make the filling, you mix all the filling ingredients in the order described in the directions. Then, the filling is poured into the crust and the entire cheesecake is baked as directed. I’m so sorry. I assumed you meant the cheesecake filling because there are no eggs in the pecan filling. The only ingredients in the pecan filling are the ones listed under “for the pecan filling”: sugar, corn syrup, butter, eggs, pecans, and vanilla. After you make that filling, that goes into the crust. Then, you make the cheesecake filling, which does have eggs, and pour that on top of the pecan filling. I’m a bit confused. You mentioned there are no eggs listed in the pecan filling, but then listed eggs as one of the ingredients- its also listed in the recipe. I have the same question as the previous poster- is it okay to boil the ingradients with the 2 eggs or should they not be included in the filling? Thanks so much, your recipe looks wonderful! You’re both right. Can you tell it’s been a long day? Sigh. Anyway, there are eggs in both fillings. The ones in the pecan filling get mixed in with all the other pecan filling ingredients and brought to a boil. 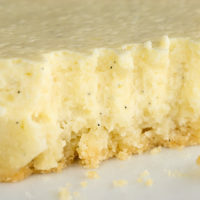 The eggs in the cheesecake filling are mixed in as described. My apologies for the confusion. I LOVED this recipe. 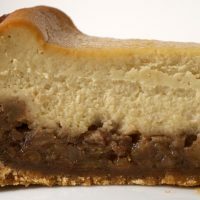 I had a pecan pie cheesecake at a restaurant and I had to look online to see if I could find a recipe. I made this twice around Thanksgiving time and everyone loved it. Both times I made it, it cracked in the middle. Even though it didn’t look perfect, it tasted perfect. Not sure what I can do about the cracking, but I got over it after I had my first bite! How can I make the pecan layer thicker? Could I layer them like pecan on bottom and top and cheesecake in the middle? I just want more pecan layer. Hi, Nicole. If you try to add a top layer, it may sink through the cheesecake filling. You could try making more of the pecan layer. Doubling might be too much, but an extra 50% might be okay. I’ve never tried it, so I can’t offer much advice. Just make sure your springform pan will hold the extra volume. Or, maybe top the finished cheesecake with glazed pecans? Where do I begin. 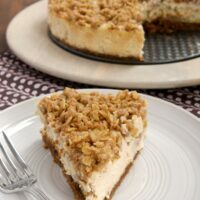 I have been searching for the one cheesecake recipe that will be my go to for a long time to come. With this pecan pie cheesecake I HAVE! However, just a friendly suggestion. I’m not sure if the issue has already been addressed but are you aware that your direction for the pecan pie filling says to heat on stove top for 8 to 10 minutes? Well I did and OMG I created a brick. Anyway, second try was a charm. Heated the pecan pie filling for only 3 to 4 minutes. Jon, I’m so glad you liked it! It’s one of my favorite cheesecakes. The time for cooking the filling is just an estimate, as you just need it to thicken. The amount of heat makes a big difference. On a low simmer, it can take up to 10 minutes. A higher simmer will cook it more quickly. How do you keep it from cracking in the middle? Ashli, I’ve never had a cheesecake crack when I make it the way I described in the directions. The time in the oven without the heat really helps. I just made this for Christmas and my crust did not stick well, and I couldn’t figure out a way to get the cake out of the springfoam pan. So its ugly on top. What can I do next time to get it out without it looking ugly and the crust sticking all the way around? Hi, Brandy. I’m sorry you had troubles! Running the knife around the edges of the pan should be enough to prevent the sides from sticking, so that it looks lovely when you release the latch of the pan to remove the side of the pan. After the side of the pan is removed, I generally don’t remove the cheesecake from the bottom part of the pan. That can sit on a serving plate or cake stand. This was the first cheesecake I’ve ever made and it turned out perfect! The only problem I had was slicing it, the crust was to hard to slice and the pecan pie filling stuck to the crust but it was still delicious! My family loved it! I went exactly by the directions, what would you recommend to make the crust be a little softer? I’m sorry you had troubles, Melissa. If you used a dark pan, then the crust could have over-baked. Every year for Thanksgiving, I make an assortment of three different cheesecakes. I let people vote on two of them, and I make this one – because it is my ABSOLUTELY FAVORITE!!!! That’s awesome, Jessy! Yay for cheesecake! Just wanted to thank you for this recipe! I make this cheesecake at least 2-3 times a year and have been for the past few years. It’s always a favorite!!! So good! I’m so glad it’s a hit, Shea! Now I want to make it for our Thanksgiving dinner! I am wondering about adding a pumpkin cheese cake filling? Hi, Diane. If the recipe for that filling is similar to this one, I would think that it would work. Hi Jennifer! I wanted to let you know that I’ve made this cheesecake several times over the years and it’s always a hit. My family requested it again this year for Christmas. Thank you for your recipes and inspiration! That’s wonderful, Emily! It’s been a popular request in my family, too. Happy holidays!